To sum up: Avast! These pirates be a likeable lot; harmless folk more interested in winning awards than inspiring terror through thievin' and pillagin'. Fear ye more England's queen! And beware of Darwin, he's evolvin' a plan, he is. 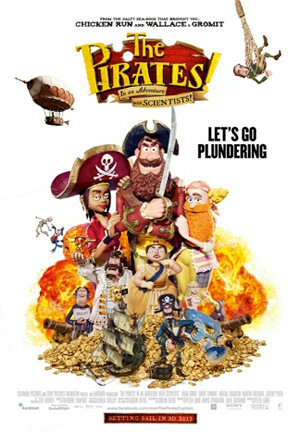 What do you do with a movie that's about cut-throat Pirates who are too darn nice to cut throats; essentially is a "kids" movie that is laced with jokes but, is more about wit than pooping or farting; is animated not in over glossed CG. but, primarily, old fashioned 2-D stop-motion animation? Why, you go see it, of course! The Pirates! Band of Misfits, a film crafted with their distinctive look and comedic flair, is the latest creation from Aardman Studios, the creators of "Wallace and Gromit" and the wonderful June, 2000 theatrical release Chicken Run (which, if you haven't seen it, for Shame! Get thee to Netflix!). During the time when England commanded the seas, her ruler Queen Victoria (Imelda Staunton) had her iron heart set on one thing, the eradication of pirates. But pirates do exist, still sailing the seas and plundering at will. The Pirates! tells the story of the world's most amiable crew of pirates you'll ever come across. There's the Surprisingly Curvaceous Pirate (Ashley Jensen), buried under a red beard so convincing, that you can almost see the hooks that fasten it behind the ears. There's Brendan Gleeson as the Pirate with Gout who loves ham night more than cutlassing. Next is the first mate, The Pirate with the Scarf (Martin Freeman), able to amicably keep his captain focused on the task at hand. Finally, there is the pirate's captain, who goes by the terror inducing name of... the Pirate Captain! Capably voiced by Hugh Grant, the Captain is the film's naive but likable lead who has one desire in life, to be a successful enough pirate to take the most booty and win the coveted "Pirate of the Year" award. The script, aided by Grant's plucky performance ensures that even when this pirate blunders, your heart is with him and you know he'll do the right thing. And so our captain leads his happy crew onto the seas to achieve his goal, though, at their best, one wonders if the most threatening they could be would be in the form of a strongly worded letter to the editor of "Pirate's Weekly". But sailing about, they eventually come into contact with an as yet unknown, Charles Darwin (David Tennant), an unfocused scientist in search of a theory. But once Darwin sets his eyes on the captain's "parrot", he sees a way to gain scientific credibility by presenting said "parrot" at the "Scientist of the Year" competition. See, even during the 19th century, there were too many awards ceremonies. The Captain sees this as a way to gain a lot of booty even though it means sailing his crew into the heart of Queen Victoria's empire and certain death. And let the fun begin, though at this point, it has already begun; at the beginning of the film actually. It is under this framework, which is based on the works of writer Gideon Defoe, that director Lord and his team bring their usual creative flair. And that is the joy of their style of films. There seems to currently exist a glut of uniformity with the majority of animated films, all of them existing in a fog of snarky asides, pop culture references, and humor often laced with a healthy dose of cynicism (not that this reviewer is above any of these). Even Disney is not immune to it, and it could actually be argued that this modern trend started with Disney way back in 1992 with the film Aladdin. But the Aardman Studios team have managed to stay away from this, concentrating on a style that derives most of its humor from characters and situations. Dare I say that there's a niceness to Aardman's films; an honest lack of cynical humor that is refreshing after feasting over and over on the type animated films that I've described above? And all with nary a fart or groin hit in sight. Another thing that is out of the norm and makes the film special, is the fact that the majority of the movie was accomplished using the aforementioned traditional stop-motion animation. For those of you new to the class, once upon a time some animation was done by filming actual models, which were slightly moved by hand, one frame at a time, so that when the film was projected at the normal rate of 24 frames a second, it would give the model the illusion of movement. And though Lord did utilize green screens and CGI to enhance to environment, create water for the pirate ship to sail upon, and extend sets (hey, even Harryhausen used matt paintings); the key components of the film, the characters and the physicals sets they occupied, were psychically real. This gives the film a refreshing real life texture that, at its best, computer generated imagery still cannot accomplish. It also allows the set designers to place many subtle enhancements to the sets, whether in the variety signs and trinkets that are displayed throughout, or in the form of the various styles of construction that could be utilized to create those sets (when it's built by hand, not every nail is in the perfect position). Both of these touches can still only be achieved through the actual tangibility of the real world and as yet on the computer, and they gave the film a refreshing look with oodles of visual trinkets to spy out and enjoy. It was a surprising change of pace that underscored the fact that stop-motion should always be a viable option for animation creativity. But even with these positives the film does suffer from a few faults. The pacing and humor, while often on the mark, is at times a bit slow and not as sharp as it was in their previous endeavors. This leads the film to have some lulls when a tighter script and pace would have helped. Also evident is the lack of development of the secondary characters. Some, including Black Bellamy (Jeremy Piven), the Pirate King (Brian Blessed), and especially Cutlass Liz (Salma Hayek, proving once again that there is no form in which she presented, that she cannot be hot), are interesting additions, but limited in screen time. Tennant's Darwin is a unique mixture; a pro-antagonist, whose naivety saves him from being hated. And Imelda Staunton's Queen Victoria is as rapacious as her visage suggests. I have to wonder what the real Victoria did to warrant this film's love. But the biggest oversight is to keep the crew to the one-dimensional types that they were in my description above. They are visually distinctive, yes, but their personalities are essentially interchangeable. Unfortunately, while they are likable, they are not given the careful characterization strokes that the artistry of Chicken Run's secondaries were afforded. The one standout is Mr. Bobo, Darwin's servant, who may be the smartest of the bunch and is certain to steal the film. After all of this, the question remains, "Am I not entertained?" Rest assured The Pirates! is rollicking cruise of pleasure; full of smiles, laughs, and enough cheer to navigate away from the cares of the world and into a port of fun for scurvy dogs of all ages! Set sail before the pirates disappear over the horizon.